At the time when India faces military threats from both Pakistan and China, the defence outlay is unlikely to completely meet the operational requirements and capability development programs of the defence services. It has been increased by 7.81 per cent to Rs 2.95 lakh crore over last year’s Rs 2.74 lakh crore allocation. total outlay of Rs 24,42,213 crore. Out of this, Rs 2,95,511.41 crore has been earmarked for defence. (This accounts for 12.10 per cent of the total central government expenditure for the year 2018-19 ). The Defence Budget allocation is just about 1.58% of the GDP for 2018-19 (lowest figure since the 1962 war with China wherein it was 1.65%).The minimum inescapable requirement of the Indian Armed Forces to keep up with its envisaged modernization plan is 2.5% to 3% of the GDP. China and Pakistan, India’s competitor and enemy, spend 3% and 3.5%, respectively of their GDP on defence. The Defence Budget allocation is just about 1.58% of the GDP for 2018-19 (lowest figure since the 1962 war with China wherein it was 1.65%). The minimum inescapable requirement of the Indian Armed Forces to keep up with its envisaged modernization plan is 2.5% to 3% of the GDP. China and Pakistan, India’s competitor and enemy, spend 3% and 3.5%, respectively of their GDP on defence. Allocation of Rs 21,338 crore for modernisation was grossly insufficient even to complete the required previously committed payments of Rs 29,033 crore, which has been earmarked for 125 ongoing schemes, emergency procurement of armaments and weaponry for 10 days of intense war, and other Director General Ordnance Factories requirements. An increase of 4.5% in revenue component would get totally consumed during the implementation of the Seventh Pay Commission. 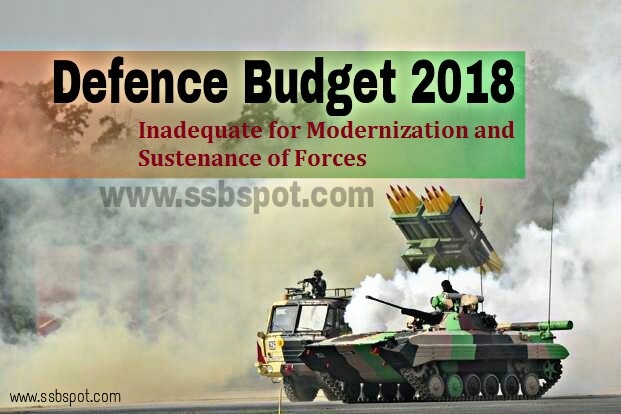 Hence, funds for operations and maintenance, which can seriously affect combat preparedness was not really taken under consideration in this year’s budget. The Indian Air Force is currently having 31 squadrons, whereas, the requirement is of 45 combat squadrons. Both Army and Airforce are seeking to upgrade its missiles as well as surveillance capabilities to keep eye over the mountainous terrain. IAF urgently needs force to enhance its capability like, mid-air refuellers, AWACS, at least two squadrons of transport aircrafts. Considering China’s advancement in the Indian Ocean region, Indian Navy wants to take a giant leap in modernization to ensure its dominance by acquiring 200 ships by 2027 from its present fleet of 145 ships. Frequent Accidents on board the Kilo class submarines and slow progress of the programme to build six Scorpian submarines has been a cause for concern. Artillery requires Howitzers/ guns to replace its obsolete equipment and the equipment of the Army Air Defence (AAD) is mostly vintage, bereft of spare support for maintenance. Most of the tanks held are night blind. Besides, to increase the capacity for a two front war, especially to equip the Mountain Strike Corps being raised against China in NE India, new tanks will have to be procured. Indian army need infantry weapons like, modern rifles, machine guns, bullet proof jackets, light helmets, night vision devices, Mine Protected Vehicles (MPV). Army urgently needs to replace its aging Chetak and Cheetah helicopters. Besides, the combat capability of its Aviation Corps is also fairly down. The priority should be to have adequate ammunition inventory for a 30-day war rather than acquiring Hi-tech, high value weapons from foreign arms makers. Presently, the armed forces just about have adequate ammunition for a short 10-day war only. It clearly emerges that our defence forces are far from being fully combat ready to face all contingencies. Besides, India can only aspire to be a regional power if it focuses on the cardinal aspect of capacity building of its defence forces. Therefore, the government must increase the defence outlay, especially for modernization, cut teeth-to-tail ratio in the defence forces to reduce revenue expenditure and streamline defence procurement for prompt plugging of security gaps. Military should not be left in the lurch once again by the bureaucrats and politicians when the need arises, and make sure that we don’t have to hire stone-pelters after 10 days of war.